So, it feels like it’s been awhile but in case you forget, Ben and Johnny went across the multiverse looking for Reed, Susan, and the kids. Now, Ben “thinks” they’re dead but didn’t have the heart to tell Johnny that. So, with the help of Rachna, there new “brain”, they traveled to a universe where Doom took over as Galactus and devoured the universe (except for Earth) in order to find their Reed and Suzie. In this universe, Reed is a depressed mess, Ben Grimm was dead, Johnny was in a hospital bed for some reason, and Susan doesn’t even talk to Reed anymore. When the last issue ended, Doom-Galactus was waiting over Earth to feed on it. There Johnny Storm wakes up and flies up to space to fight Doom-Galactus but what we later find out is that this Johnny Storm took some of the power from Silver Surfer, which was the Power Cosmic. 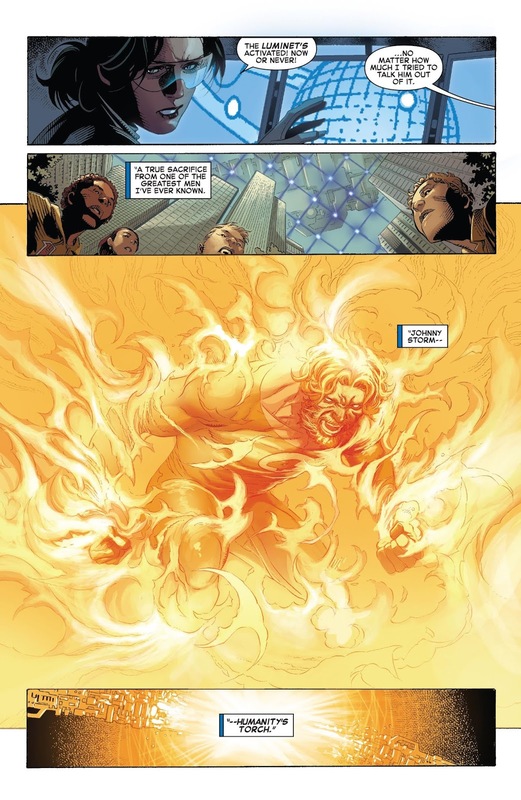 So, his flame is just as powerful as the sun and he helps the crew by firing on DG after Ben shrinks down from the Pym particles. This is also why their Johnny was in a hospital. I “think” they put him in a coma so his powers wouldn’t go off and hurt anyone. Needless to say, he lets loose on DG while our Doom and Johnny go into the spaceship that Emma Frost is on. Our Doom holds Emma’s body after she swapped minds to see their Doom talking to him. There Doom was saying that he’s seen it all. 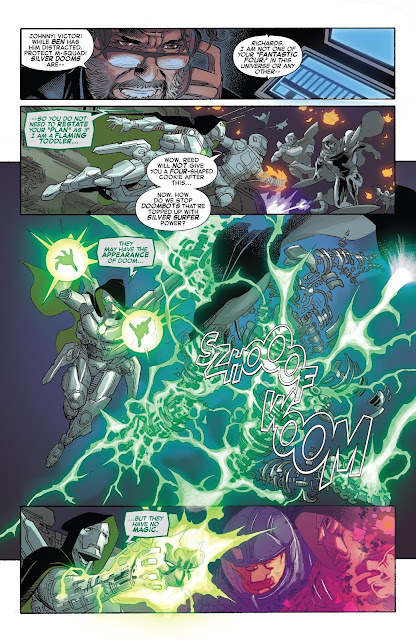 He’s seen that the Fantastic Four always win and always find a way and that Doom is always a villain. I loved that part! Then later, we see the people on Earth standing by a grave labeled Galen. 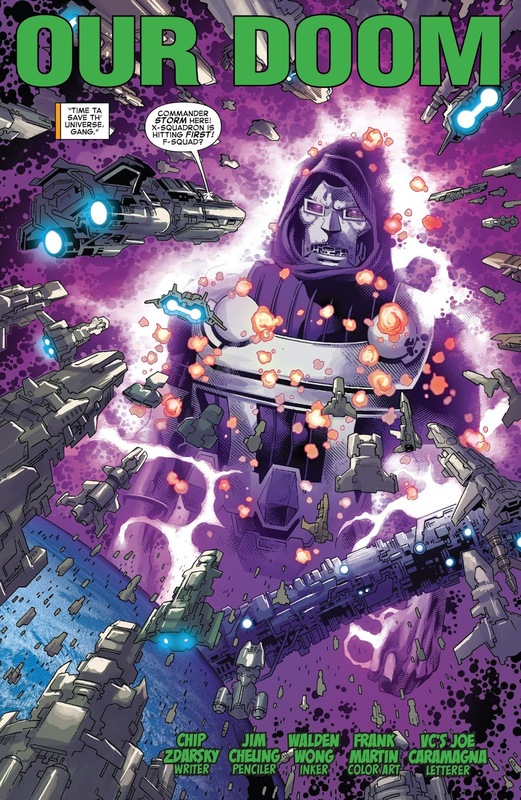 Turns out, when their Doom did this very thing back in 2005, Galen (Galactus) swapped minds and went into their Dooms body. He was so overcome with grieve after destroying so much life, that he basically died in pain and sorrow. They buried him there on Earth. 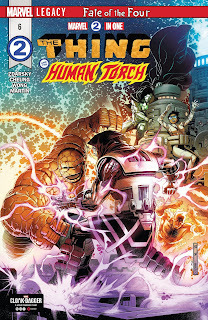 Zdarsky has been killing it with Marvel 2 in 1. This story checks all the boxes. It has fantastic art. It has creative storytelling. It has a cohesive story from start to finish. It’s complex but easy to follow. You can tell it was planned out before it was written with a beginning, middle, and end. And, it's giving us a Fantastic Four book without giving us our Fantastic Four. This is so well done and will no doubt be a trade on my shelf when this is all said and done right beside Hickman’s run. Now, I know we are getting FF back but I would love to still keep this book. I don’t know how but I would love to have my cake and eat it too. Zdarsky has been giving us an amazing story that I don’t want to see go. I don’t think we get FF until August so hopefully, we can squeeze in some amazing issues before time runs out. Pick this issue up but make sure to read the arc first. With Thanos done, I think this may be top dog in my pull list.